Port Blair, Aug. 10: The Andaman & Nicobar State Cooperative Bank Ltd. has bagged the Annual Performance Award for the year 2012-13 at the Golden Jubilee celebration of National Federation of State Cooperative Bank (NAFSCOB) in Ahmedabad on 20th July, 2014. 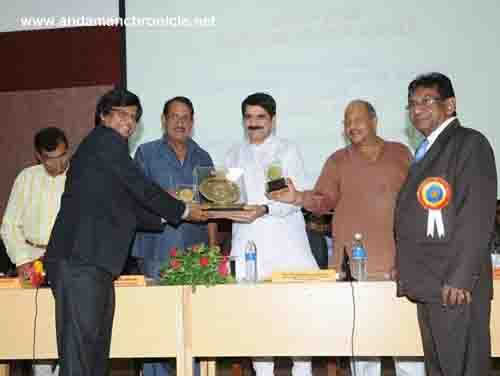 Ravinder Rao, Managing Director of the bank received the award at the hands of NAFSCOB Chairman, Dr. Bijender Singh. With the 1.75 lakh strong customer base, ANSCB has taken rapid strides to earn a good name for it. It has made its presence felt all over the islands with 29 core banking branches and by introducing RTGS/NEFT facilities, Rupay Debit card accessible over 11 ATMs across A&N Islands. The bank has provided assistance to 4530 self-help groups with a total membership of 45,300. Besides providing much needed employment opportunities to the educated unemployed youths of the islands, the bank has a number of firsts to its credit. ANSCB is the first bank in the country to introduce the home delivery of pensions for the old aged, widows and the differently abled persons. It is also giving the highest interest rate in the AN Islands on fixed deposits. ANSCB is also the first and the only bank in A&N Islands to have an All Women Branch at Garacharama-II.